I do not know where the name comes from but I think Ireland as there are three places there named Curragh. In County Waterford a small village on the coast but with no fishing apart from the possibility of sea fishing. Curragh West, in County Galway but again with no fishing available locally. The third about twenty five miles south west of Dublin is the head quarters of the Irish Army, and when it was part of the United Kingdom where the British Army in Ireland was head quartered. It is also the name of the famous Irish racecourse and close by are two rivers, the Liffey and the Barrow. I suspect that it was this Curragh that the creel was named after. With plenty of British army officers being based there, fishing available locally and the legendary Hardy nose for business I suspect that this was the reason they picked it. I also noted that in the catalogues there is also an “English” creel available. 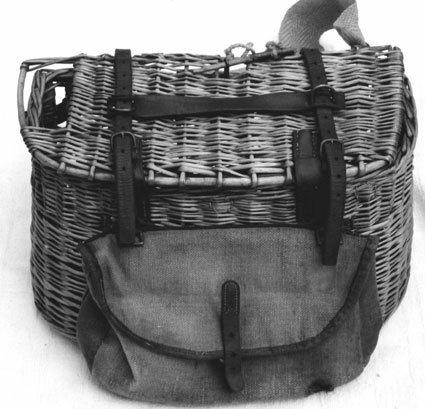 This creel first appears in the 1905 Hardy catalogue and I suspect that it was introduced in that year and a last minute addition as it appears on page 332A. Page 332B is just a “filler” showing one of the Hardy brothers making the wind cast. 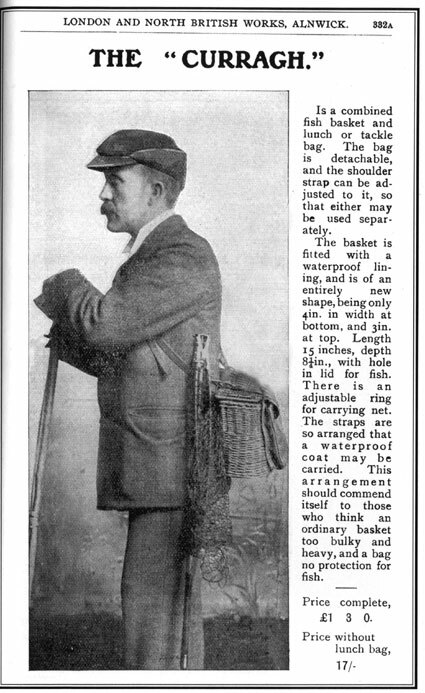 The reasons for it’s introduction are given on page 332A but I noted that the fishing bag is small and not like any that they were selling at the time. The name Hardy is stamped twice, once on the bag and once on the leather strap. The size of the stamp is incredibly small and I wonder how many of these creels have passed through collectors hands and been missed. The stamp on the bag is on the top of the leather strap. The whole bag is approximately 12 inches by 6 inches. 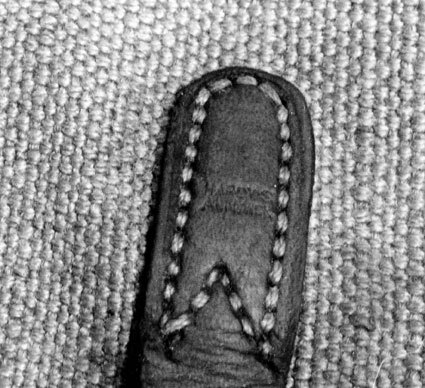 The stamp on the creel is on the horizontal leather strap and again is tiny. So small that I was unable to get a decent photograph of it. This strap is used to hold a waterproof coat. I was very surprised to discover that it was not until 1934 that the creel last appeared in the catalogues. I also found it listed on a sales list for Hardy’s Canadian agent issued around 1937. This was the first one that I had seen and speaking to other collectors we decided that it is a rare item. This entry was posted in Hardy Curragh Creel. Bookmark the permalink. Hi, Maybe you can be of some assistance given that you seem to be well versed in antique fishing tackle. We are in possession of fly rod bearing a brass plaque that reads Weekes & Son, Dublin, Ireland. It appears to be a 5 piece cedar fly rod about 12 feet long and is in 3 sections with brass farrels and extra tips in a sectioned canvas bag with a wrap around tie. We could send you pictures if that would in any way help. Thus far we can find little or no information about this rod and precious little about the fly rod its self. Would you be interested in enlightening us or helping us to find some information about this item. We found it in a home we bought and sadly no little or nothing more than that about it.